Health club operators who reinvest in their business can profitably impact key performance indicators (KPIs), according to IHRSA's 2017 Profiles of Success. Our research expert explains. 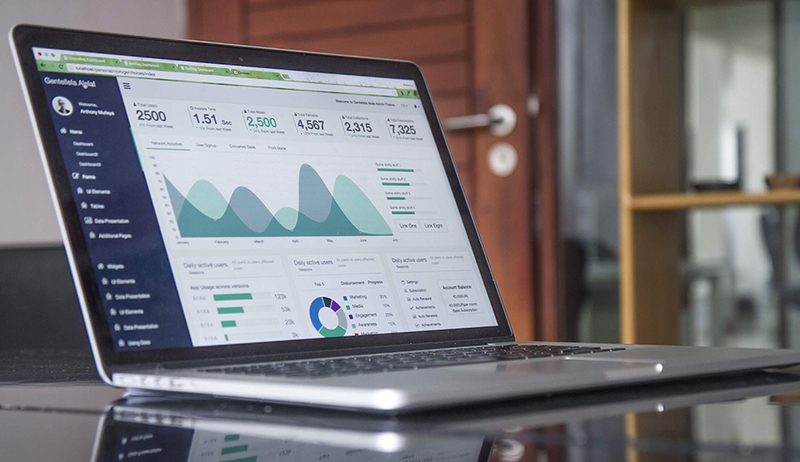 For more than 30 years, IHRSA has gathered key performance indicators (KPIs) from leading health club companies through the annual Industry Data Survey. Results are compiled in Profiles of Success, an annual publication that also provides an overview of the U.S. health club industry. As you may expect, top tier clubs have consistently reported favorable results, with recent years being no exception. Based on data from the recently released 2017 edition of IHRSA’s Profiles of Success, 113 firms, representing nearly 6,400 health club sites, posted revenue growth of 3.2% and net membership growth of 2.9% from 2015 to 2016. Perhaps most impressive was the way in which leading club operators adeptly managed expenses as earnings before interest, depreciation, and amortization (EBITDA) increased from 16.1% in 2015 to 16.8% in 2016. While these improvements may seem marginal in comparison to the double-digit results most would like to see among industry leaders, such performance has been sustainable and consistent, which is what we would expect from the top clubs in today’s marketplace. However, among the leading clubs, there is a select group that has shown a clear edge in performance results. The one characteristic these clubs have in common is club reinvestment: how much revenue they invest back into the club. Clubs among the top 25% of club reinvestment have shown that giving back to your business profitably impacts three important KPIs. Overall, clubs reported a median of 6.6% of total revenues back into the club. Those in the top 25% allocated a median of 20.4% of total revenues into the club, while the bottom 25% reinvested only 1.9% of revenues. 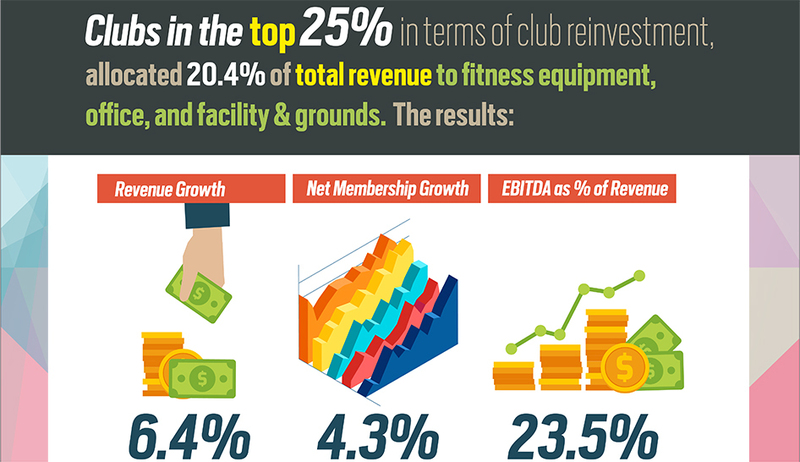 Clubs that reinvest a greater portion of revenue towards club improvements for fitness equipment, office, and grounds (where applicable) outperformed their peers in revenue growth. Clubs in the top 25% of club reinvestment posted revenue growth of 6.4%. In comparison with the 3.2% growth reported by the overall sample, the clubs that invested the most back into their facility recorded twice as much revenue growth. Revenue growth by the top 25% represented a fourfold improvement over clubs that were in the bottom 25% in terms of reinvestment. Clubs in the bottom 25% posted modest revenue growth of 1.5%. Another KPI profitably impacted by club reinvestment is net membership growth. Clubs in the top 25% of club reinvestment posted net membership growth of 4.3% in comparison with 2.9% for the overall sample, an improvement of 1.4%. Those in the bottom 25% achieved net membership growth of 1.4%. Lastly, and perhaps most impressive considering the significant expense of reinvestments, club operators that allocated funds back into the business reported higher EBITDA. Clubs in the top 25% of reinvestment recorded EBITDA of 23.5% in 2016, while the overall sample posted a median of 16.8%. Clubs in the bottom 25% in terms of reinvestment reported a median EBITDA of 18.8%. It appears that clubs that bested the challenge of balancing expense management with reinvestment saw a profitable impact on EBITDA. But those who may not have struck such a balance may have reinvested back into the club at the expense of undercutting profitability, which may hopefully be a short-term price to pay for the long-term benefits of facility improvements. Wisely balancing expense management and club reinvestment is one of the most challenging tasks for club operators. Results from Profiles of Success shows the profitable rewards of mastering such a task.